Step back in time for a moment. Imagine yourself in 1778 marching behind George Washington's Army and you're cold, tired, and hungry. Or maybe it's 1895 and you're driving 7mph in a new-fangled machine called a horseless carriage. Can you hear the engine? "Kerplunk, hiss, pitouee!" Blow the horn, "bwonk! bwonk!" Picture yourself working alongside Thomas Edison in 1879 trying to invent the light bulb. Can you feel the anticipation? Perhaps, you live in 1858 and you’re digging for strange and monstrous bones like fossil hunter William Foulke. Can you become the character in your mind and immerse yourself in a subject that excites you? Like many writers, Michael's stories come from what interests him. Often Michael and his wife Jane travel to museums, libraries, re-enactments and historic places. They go out of sheer curiosity but sometimes stumble upon a good story that is just waiting to be told. 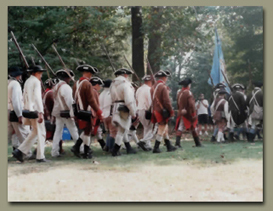 While attending a revolutionary war re-enactment Michael noticed women and children dressed in colonial costumes along with the soldiers. Why women and children he thought? He introduced himself and began asking questions. The following day, Michael went to the library and researched the Revolutionary War. In the midst of his research, Michael found that families often followed their fathers to war because they had nowhere else to go. Women and children camped right alongside George Washington's Army. They walked an average of nine miles a day, slept on the ground, worked for rations and nearly starved. Soon Michael had imagined a story he titled George Washington’s Army and Me about the re-enactors he had just met. 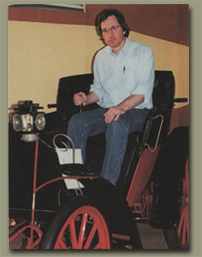 On a trip to an antique automobile museum, Michael noticed a fabulous looking horseless carriage nicknamed, the buggyaut, by its' creator Frank Duryea. Michael sat in it and pictured himself back in 1895. What would it be like to drive it he thought? How fast did it go? He went home to his library to research Duryea and the first automobile race in America. He read an account of the race in a newspaper article dated November 29th, 1895. He corresponded with the grandson of Frank Duryea and soon had gathered enough information to write The Great Horseless Carriage Race. Young Thomas Edison came out of Michael's fascination with inventions. He visited all the historic sites associated with Edison including the Menlo Park Laboratory and the Edison National Historic Site in West Orange, New Jersey. Michael wanted to see firsthand just what the inventions looked like and how they worked. He watched a movie on an 1894 Kinetoscope and listened to a recording of "Mary had a Little Lamb" on Edison's 1877 Tinfoil Phonograph. 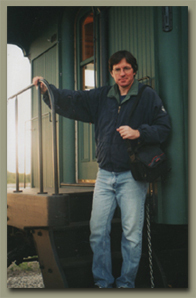 Michael rode a train just like the one Edison worked on as a boy, and sat in the baggage car that Thomas had converted into a laboratory. Michael’s next book is about strange and monstrous bones. Almost everyday Michael drives by an eight feet tall bronze statue of a Hadrosaurus. It is a constant reminder that Haddonfield, New Jersey was the location where fossil hunter, William Foulke unearthed the first nearly complete dinosaur skeleton in 1858. Fascinated by this relatively obscure story Michael began his research at the Academy of Natural Sciences in Philadelphia where he touched the actual dinosaur bones. Titled, Fossil Hunter, Michael’s story tells the tale of the discovery that changed the way people imagined dinosaurs. 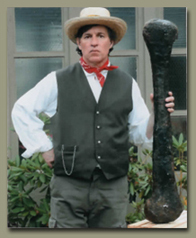 For the first time people could say, “So, this is what a dinosaur looks like!” To illustrate the story, Michael made a fake dinosaur bone of foam, painted it to look like one he saw at the Academy and posed in costume as William Foulke. For Michael, researching a subject is as exciting as writing and illustrating the story. It's like stepping back in time.